San Andreas can claim momentary mastery of digital fear. On one hand, it has the look of being created entirely on a computer in the studio’s tech room. On the other, it has threaded an appealing family story through the chaos. And then there’s the matter of Paul Giamatti as a serious scientist trying to warn Calfornians of what’s coming. Given these ingredients, it’s your call whether to laugh or shiver as you watch. The whole thing would be a comic exercise if it weren’t for the sliver of a root in scientific prophecy. As for the digital chaos, it starts early with scenes of the Hoover dam shattering in mere minutes. From there the quake moves to Los Angeles and then San Francisco while earthquake expert Dr. Lawrence Hayes (Paul Giamatti) of the California Institute of Technology explains that this is exactly what will happen when the two tectonic plates collide under the San Andreas fault. His explanation of why this is 100 years overdue is the sliver of reality that runs through the movie. But because both the visuals and the family story are preposterous, reminders of reality can be easily dismissed – sort of. As to the family. 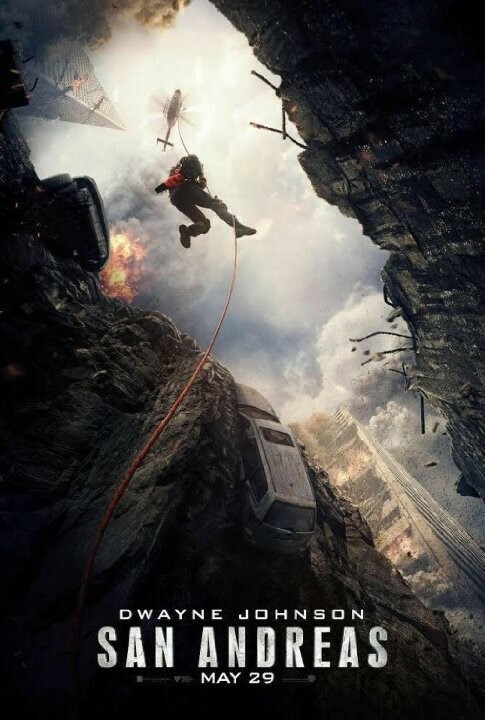 Ray (Dwayne Johnson) is a fire department rescue pilot of heroic dimensions; his wife Emma (Carla Gugino) is divorcing him for a dweeb named Daniel (Ioan Gruffud) and if we’re confused about California’s destiny, we know from moment one that Ray and Emma belong together. In a nice family sub-plot, daughter Blake (Alexandra Daddario) is thrown together during the quake with Ben (Hugo Johnson-Burt) and his little brother Ollie (Art Parkinson). This three brave new friends help each other through catastrophe while we rest in the comfortable certainty that no movie would dare to let any one of them die. We watch them escape the impossible at every turn as the soundtrack bombards our ears with the thundering sound of the destruction of three major cities. Nothing illustrates the absurdity of this blockbuster more than the survival and happiness of the five leads who endure the impossible as entire populations of cities die in splintering urban buildings as they crumble. On the upside, all five of the principal actors build credible characters in the preposterous destruction that engulfs them and we find ourselves rooting for them. Keep your eye on the young actor Art Parkinson who manages at his very young age to make Ollie fully capable of bravery, loyalty, and love. And because the whole thing is so silly, it’s easy to ignore Dr. Hayes’ lecture on the probability of a real collision of tectonic plates along the San Andreas fault. So have fun with the family; they’re really a very appealing bunch. And you can watch the earthquake scenes through the fingers that are covering your eyes while assuring yourself that this is absolutely not a computerized version of what Dr. Hayes has described as inevitable future reality. This review was posted on June 20, 2015, in Action/Adventure. Bookmark the permalink.